On his way to the United States (US) to attend the United Nations (UN) session, the Indian Prime Minister (PM) took a brief stopover in Ireland on September 23, 2015 which he himself hailed as a brief but historic trip. The trip is called historic not for being the first visit by an Indian PM after Jawaharlal Nehru’s visit in 1956 but because of the opportunities arising for both the countries after this visit. Indian and Irish relations date back to pre-independence times when several Irish nationals came to India after joining British India civil services and along with Christian missionaries. India was the first country with which Ireland established its diplomatic relations in Asia. The Directive Principles of State Policy (DPSP) in the Indian Constitution are also inspired by the Irish Constitution.Recognising the contribution of Irish officials Thomas Oldham and Sir George Abraham Grierson who made first systemic coal mapping and first linguistic survey in India respectively, the Indian PM gifted relevant manuscripts and papers from National Archives of India to the Irish counterpart. Despite the historical connection, the relations between India and Ireland were not very upfront till the year 2000. Till late 1990s, the Irish economic growth was mainly dependent on its trade relations with Europe and the US. It was only after 1998, that Ireland launched its ‘Asia Strategy’ focussing on Asia which was largely concentrated on China. However, both the countries made a Joint Working Group (JWG) in 2000 for cooperation in the IT sector. India Irish relations opened a new chapter in 2006 after the visit of then Irish PM Bertie Ahern. Since then, Ireland has been very supportive of Indian interest in international diplomacy. It had supported India specific exemption from Nuclear Suppliers Group (NSG) in 2008. While in Ireland, Indian PM sought Irish support for United Nations Security Council (UNSC) reforms within a fixed time frame. On the economic front, Indo-Ireland ties are way below its potential. As per the Irish government data, the trade between two nations was EUR2.48 billion (USD 2.77 billion) in 2013 which is miniscule compared to the overall trade volume of both nations. However, both leaders have agreed to boost the trade ties in coming years. Ireland had agreed to bring changes in Visa requirements concerning Indian IT professionals. Currently, very few Indian companies have presence in Ireland like Wockhardt, Ranbaxy, Reliance Life Sciences, Crompton Greaves, TCS, HCL Technologies, WIPRO, Tech Mahindra, Hindustan Zinc etc. Both leaders also recognised the potential for cooperation existing in the field of Science and Technology and education. 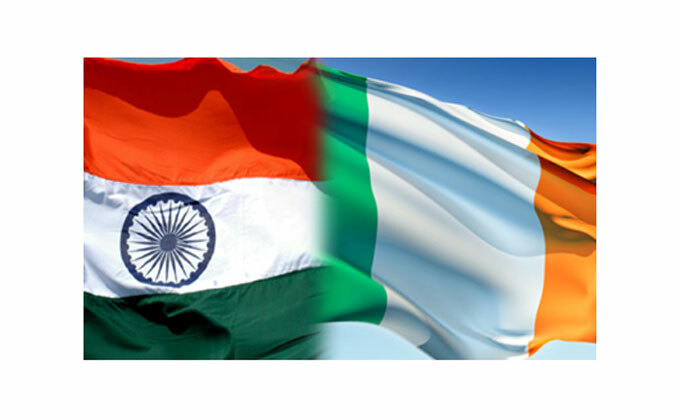 The launch of an Ireland-India Business Association in May 2008 has helped in increasing the interactions between business communities of the two countries. PM also recognised the potential of Ireland for becoming a gateway to Europe and a bridge across the Atlantic Ocean. He stressed that sound relations with the Ireland will help in the resumptions of discussions on India-EU Broad-based Trade and Investment Agreement. Ireland could also help in sensitizing the EU over Indian commercial interests. Thus, the tour of Indian PM to Ireland was meant to increase the scope India and Ireland beyond the economic relations. He claimed that India can serve as an anchor of Ireland in Asia while India can improve its presence in Europe and Atlantic by virtue of Ireland. The support for UNSC reforms also highlights the maturing of Indo-Ireland relations. The Indian PM visit to Ireland has indeed opened a new chapter in the bilateral ties expanding the horizons beyond the trade and economic relations.